Three years ago I left my hometown in Philadelphia and moved to Miami to start college. Besides the obvious differences between the two cities, there were also MAJOR differences in the food that took some getting adjusted to. However, as adapted as I have become to Miami cuisine, the inability to find good bagels and good pizza remains a serious frustration. So on the very rare occasion that I do finally come across a good slice of pizza, I get all sorts of excited and tell every one of my Northern friends about my new discovery (when I found Piola…I shouted it from the roof tops). My boyfriend and I actually came across Piola by chance one night after a late flight back from Spring Break. We headed straight to Brickell from the airport to meet friends and decided to stop at the first open food place we saw. Thankfully, that place turned out to be Piola!! We sat up at the bar and each ordered our own pizza. Roberto got the Diavola, which is a standard plain pie with spicy salami…and let me tell you, their salami is spicy (we both loved it, but that’s a warning for all you spice haters). I ordered the Miami Beach, which is a plain pie topped with cherry tomatoes, fresh mozzarella, and arugala (I also added garlic and kalamata olives to amp up the flavor, making it taste like a bruschetta). Both pizzas were incredible!! They are on a very thin crust, which is nice and crispy and the tomato sauce is great (not sweet, which is an odd new trend that my Italian side does not like). The pizzas are also large (about 12”) and really reasonably priced, despite the gourmet toppings (approx. $9-$12 per pie). However, please note that I only give Piola’s PIZZA four stars, because tonight I ordered a couple salads for dinner and they were very disappointing. I asked for the dinner portion and they were as small as side salads!! Also, I added chicken to all of them and the chicken was so tough and clearly not freshly grilled, judging by the temperature…it was almost inedible. I have not ever tried the pasta dishes, but based on this experience tonight with the salads, I plan on sticking to pizza at Piola. Their tagline is “famosi per la pizza” for a reason, because pizza is what they do best. So order any one of their 40 or so pizza pie combinations and you will not be disappointed. 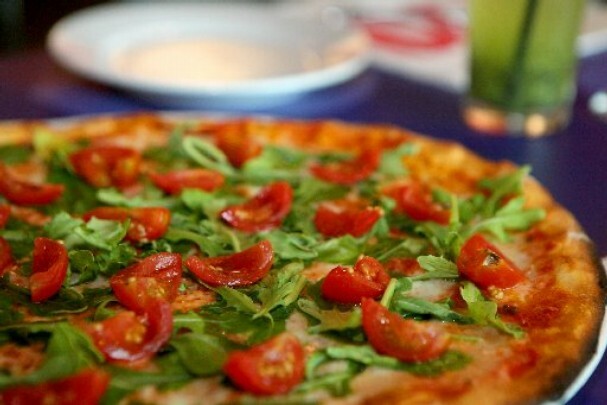 I think that Piola is the best pizza in Miami along with Spris, which has locations on Lincoln Road and Miracle Mile. I have continued going back to Piola on a weekly basis since my first time trying it (caution: it may be habit forming!) and since then I have also tried the Pizza Bruxelles, which has ricotta, fresh tomatoes, basil and mozzarella. This is a white pizza and although I rarely like white pizza (because sauce is just soooo good), the pizza is truly delicious. The ricotta adds a nice sweetness to balance the salty mozzarella and the chopped tomatoes on top of the pizza add just the right acidity, which compensates for the lack of sauce.